After a relaxing time of recovery in Toronto, we headed out to Mississauga. We got to see some nice things in Toronto, including the wavy boardwalk I mentioned in another blog post, as well as this cool bridge. I love bridges, and methinks perhaps one day I’ll do a bridge-themed trip, where I get to go see all the cool bridges all over the world…. Mmm another item for my bucket list. As we were leaving Toronto, we stopped at George Brown University to have a snack and use the washroom. It’s a nice campus, and it was nice to see where Dan’s cousin, Andre, went to school. Andre is an accomplished stage actor and is currently working at the Stratford Festival. We still haven’t had a chance to go see one of his plays, but we plan on doing so soon. On our way out of Toronto, we needed something for one of our bikes, and luckily, we spotted a bike shop. 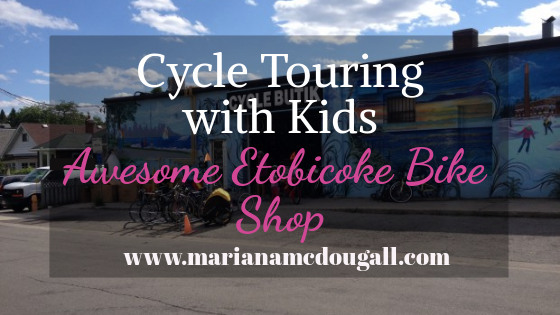 We stopped at Cycle Butik in Etobicoke. The owner was very friendly and it was nice to get our bikes quickly checked over before continuing on our tour. We were served by a really young looking guy, but it turns out he was 64. I guess biking keeps you young. I was impressed by the beautiful mural on the outside of the shop. We visited some more cool playgrounds on the way to Mississauga, and we also stopped at a nice little beach to watch the ducks.